Like all things cloud, things change. This was based on September 2014 data and findings. Writing today about shared mailboxes as a customer recently had several requirements and in reviewing the service description, I have found some inconsistent information. A user must have an Exchange Online license in order to access a shared mailbox. 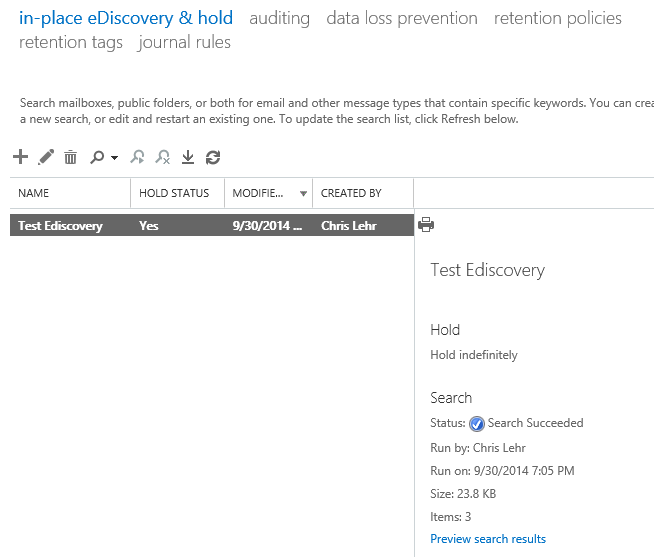 Shared mailboxes don’t require a separate license. However, if you want to enable In-Place Archive for a shared mailbox, you must assign an Exchange Online Plan 1 or Exchange Online Plan 2 license to the mailbox. 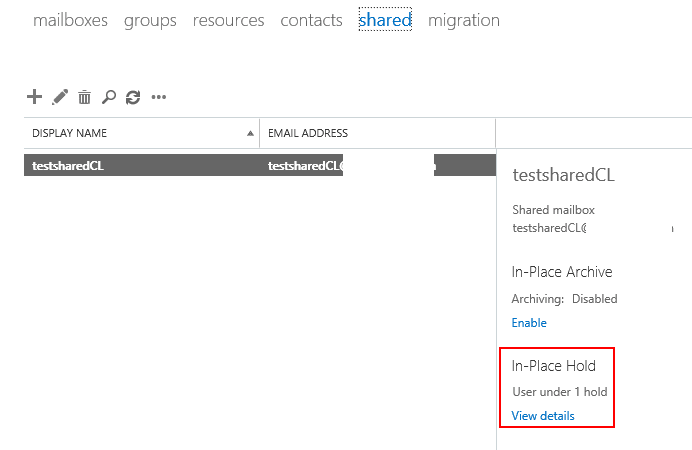 If you want to enable In-Place Hold for a shared mailbox, you must assign an Exchange Online Plan 2 license to the mailbox. After a license is assigned to a shared mailbox, the mailbox size will increase to that of the licensed plan. How large can a shared mailbox (no license) be? Can you put shared mailboxes into litigation hold or in-place hold? If you needed >10GB mailboxes or in place hold, how would you assign a license? 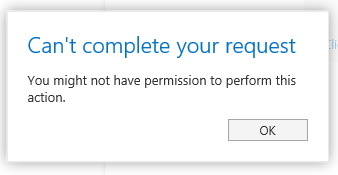 So, either the service description is incorrect, or PowerShell's quota reporting of space is incorrect. 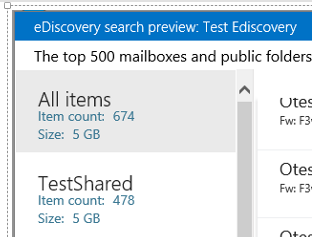 So, I started stuffing the shared mailbox. I have a pretty nice home PC. SSD, 32GB RAM, etc. 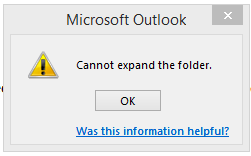 I'd say around 5GB, using Outlook 2013 with all current patches, a shared mailbox became pretty slow and difficult to work with, even in OWA and Outlook 2013. Based on the service description, you need a license for both litigation hold or in-place hold. 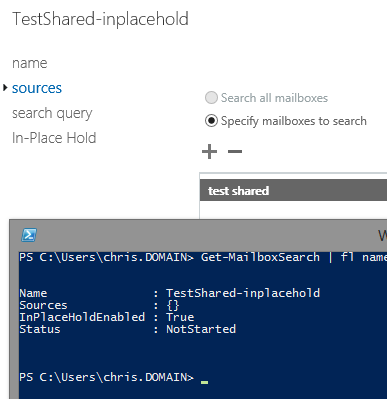 Here's the GUI versus powershell of my in place hold. 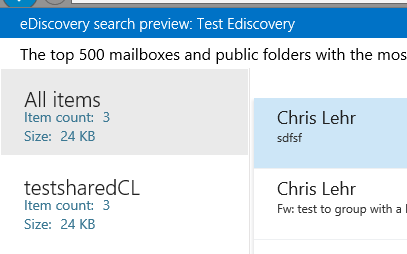 You can see that in shell it shows there are no sourcemailboxes but the GUI shows I have an in place hold. Confusing and very misleading. And the preview shows my data! But can we trust it? Is it really holding data? The answer is yes. Here's a trimmed screenshot of a prior test (not the same as the in-place hold) that captured data. Even better, this mailbox was deleted, so this also proves that it is in litigation hold since the mailbox is no longer enabled, we know we are not searching an active mailbox. According to the Service Description, if you need in place hold or larger than 10GB shared mailboxes, you need to assign an Exchange Online Plan 1 or Plan 2 license to the mailbox. However, since the mailbox is shared, you cannot assign a license to it. So I opened a quick case asking "how do I apply a license to a shared mailbox?" Their answer was simple - you need to convert the mailbox to a user mailbox. UPDATE 10/1/2014: Thanks to Nino Bilic for pointing out, you ABSOLUTELY can license a shared mailbox. 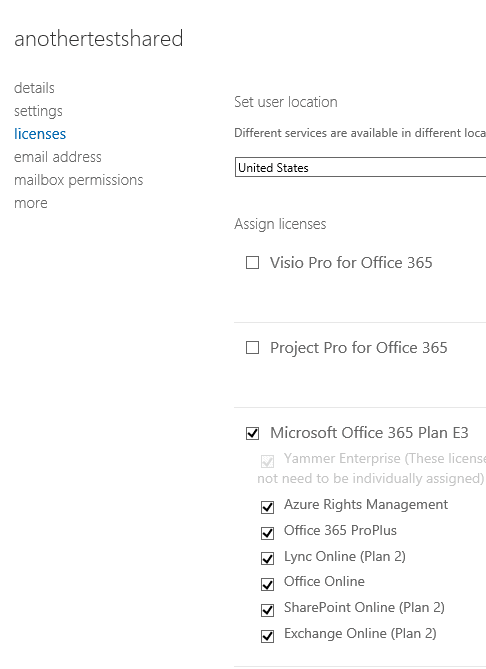 In O365 Users, search for it, and add a country and license. He also advises that while quota and hold status may be working without a license, you should license them, in case Microsoft decides to enforce licensing, it could put you in a state of non compliance or over the size limit shared mailboxes! UPDATE 10/8/2014: Another nod to Nino - In this article, Microsoft addresses Exchange Online licensing required and explicitly mentions Litigation Hold as WELL as in place hold require an Exchange plan 2 license! Quota, litigation and in-place hold all function as expected on shared mailboxes without a license, however this could change and be enforced at any given time, so obviously recommend using licensing if the functionality is needed.